Consumers who buy precious metals encounter price terms like, Second London Fix, Spot, Futures, Settlement and Aftermarket, which tend to become confusing, and occasionally cause suspicion and misunderstanding between customers and metals dealers. This article is a simplified explanation of how metal prices are determined. This occurs in the US between 10-11AM Eastern time and generally reflects the price of gold in England and Europe for that day. This index is posted daily in the Wall Street Journal and on most newspapers’ financial pages. Many gold and silver dealers and their customers agree in advance to use the London fixings as a basis for transactions. This eliminates any confusion as to the exact gold price which changes constantly during the day. London silver is always 7-8 cents higher because of their higher purity requirements of .9995 versus .999 on the COMEX. In the US, metals are traded within the NY Mercantile Exchange, COMEX division, from about 8:20AM to 1:30PM. If a person wanted to buy gold during trading hours, the price paid for a current month contract at that instant, would be called the “spot” gold price, which often changes minute by minute. metals are traded in future months as well as for immediate delivery. Futures contracts are firm commitments to make or accept delivery of a specified amount of a commodity during a specific month in the future, with the price locked in at the time the commitment is made. Futures contracts involve a great amount of speculation. For example, only about 1% of silver future contracts made each year result in actual physical delivery of silver. Instead, traders generally offset their positions before their contracts mature. Some months contain many futures contracts and others very few. The actual spot price is determined from an adjustment to the most active trading month. During the day many radio and TV stations, and some electronic trading networks erroneously report the most active futures month, or the London fixing as the gold price. At 1:30 the bell rings announcing the end of COMEX trading for the day. The last trade on the board for each month’s futures contract is the daily “close” for that month. As the bell rings there are always a number of trades in brokers’ hands that have to be settled before the traders can close their books for the day. The price used to settle these trades is called the settlement. It is usually slightly higher or lower than the “close”. Gold trades virtually 24 hours a day somewhere in the world. As one market is closing another is opening somewhere else. Aftermarket refers to the price metal traders use after the COMEX closes. If a metals dealer says, “We are calling gold $300.”, it usually means the NY market is closed and the price they are quoting for buying or selling is different than the COMEX settlement price. Sometimes there are markets within the markets. Wild speculation or certain events often cause metals to skyrocket or crash. 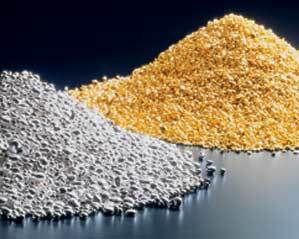 Dealers who buy and sell actual metals sometimes use other than COMEX contract prices. As an example, Russia withheld delivery of platinum and palladium in 1998 creating a temporary shortage and sudden dramatic price increase in these metals. While platinum was actively trading for $450 on the COMEX, coin dealers were “calling” platinum $415, a price they actually used as a basis to buy and sell platinum. The reason was that the turn-around for refining platinum is 12 weeks. If a trader had refined platinum in a “pool account” he could have realized the $450 per ounce. The metals buyer should understand that there is not always an absolute price of any particular metal. It sometimes depends upon how and when you look at it. A reputable, ethical dealer will always be able to quote the correct price, before and after COMEX trading.